You are on Introduction. Skip to the next section. This is an inpatient unit property. You are on Getting Here. Skip to the next section. 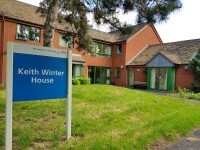 Keith Winter House is located on Keith Winter Close and can be accessed by the A45. Keith Winter House has its own car park for staff and visitors with one Blue Badge bay. The nearest bus stop is located on Stourbridge Road with routes 90, 91, 114, 144A, 147, 318 and 322 operating here. The nearest train station is Barnt Green which is approximately 4.2 mile away. The link below are for the bus providers near Keith Winter House. To view the web page described above click here (opens in new tab). You are on Getting Help and Assistance. Skip to the next section. Staff receive disability awareness/equality training. Staff do not receive deaf awareness training. A member of staff trained in BSL skills is not normally on duty. British Sign Language interpreters can be provided on request. Language interpreters can be provided on request. The alternative formats documents can be provided in include; Braille on request, large print on request, Makaton on request and different languages on request. 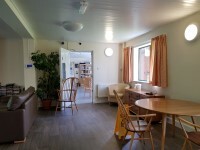 An assistance dog toilet area can be provided onsite. 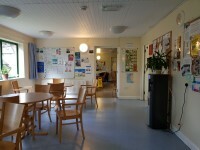 There is not a wheelchair to borrow to aid transferring around the building. Water bowls for assistance dogs are available. Home visits services are not available. There is free patient Wi-Fi access at this venue. You are on Parking. Skip to the next section. The venue does have a dedicated car park. The car park is located at the front of the building. The car park type is open air/surface. The car park does not have a height restriction barrier. The car park does not have a barrier control system. The car park surface is tarmac. There is a/are Blue Badge parking bay(s) available. The Blue Badge bay(s) is/are clearly marked. 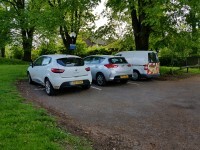 There is/are 1 designated Blue Badge parking bay(s) within the car park. The dimensions of the designated Blue Badge parking bay(s) surveyed are 288cm x 477cm (9ft 5in x 15ft 8in). There is not a 120cm hatched zone around the Blue Badge parking bay(s). 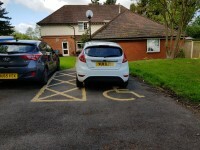 Parking spaces for Blue Badge holders do not need to be booked in advance. There are not parking charges for the car park. The route from the car park to the entrance is accessible to a wheelchair user with assistance. Assistance may be required because there is / are uneven surfaces. The entrance is clearly visible from the car park. The surface on the approach to the entrance is tarmac. The nearest designated Blue Badge parking bay is approximately 22m (24yd 2in) from the Main Entrance. You are on Bus Stop(s) and Drop-off Point(s). Skip to the next section. There is not an onsite bus stop. There is not a/are not clearly marked onsite drop-off point(s). You are on Opening Times. Skip to the next section. This service is open 24 hours. You are on Outside Access (Main Entrance). Skip to the next section. This information is for the entrance located at the front of the building. The entrance area/door is not clearly signed. There is step free access at this entrance. 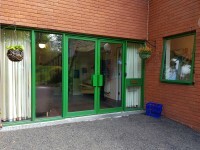 There is not a canopy or recess which provides weather protection at this entrance. The entrance door(s) does/do contrast visually with its immediate surroundings. The bell is not in a suitable position to allow wheelchair users to gain access. The main door(s) open(s) away from you (push). The door(s) is/are double width but one door is locked. The width of the door opening is 80cm. There is a small lip on the threshold of the entrance, with a height of 2cm or below. 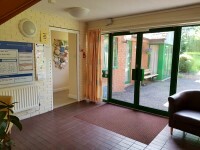 Both entrance doors can be opened by a member of staff if required. You are on Inside Access. Skip to the next section. There is level access once inside. There is not a hearing assistance system. Wayfinding signage is not available. 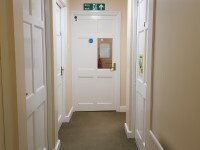 The type of flooring in walkways and corridors is carpet and vinyl/laminate. 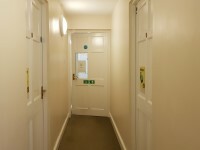 There is some flooring in corridors which is shiny and could cause issues with glare or look slippery to some people. The lighting levels are medium. You are on Other Floors. Skip to the next section. Signs indicating the location of the stairs are not clearly visible from the entrance. 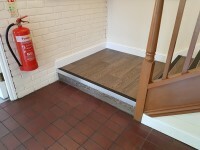 The floors which are accessible by stairs are G,1. There are 15+ steps between floors. The height of the step(s) is/are between the recommended 15cm and 18cm. The going of the step(s) is/are between the recommended 30cm and 45cm. The steps are clearly marked. The steps do have handrails. The steps have a handrail on both sides. Handrails are at the recommended height (90cm-100cm). 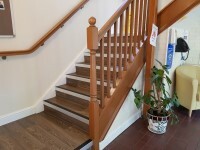 Handrails do cover the flight of stairs throughout its length. Handrails are easy to grip. Handrails do not extend horizontally beyond the first and last steps. There is not a landing. The lighting levels are good. You are on Accessible Toilet(s). Skip to the next section. There is not an/are not accessible toilet(s) within this venue designated for public use. You are on Standard Toilet(s). Skip to the next section. Standard toilet facilities are available. The female and male toilet facilities that were surveyed are located on the ground and the first floor. The female and male toilets are approximately 5m (5yd 1ft) from the Main Entrance. 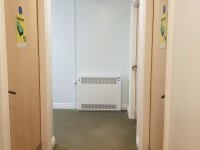 Inside the venue, there is level access to the female and male toilets. There is pictorial and written text signage on or near the toilet door. 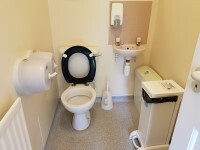 An ambulant toilet with wall mounted grab rails is not available. The tap type is twist/turn. There is not a flashing fire alarm beacon within the toilets. If our guide needs updating - just let us know using this form.